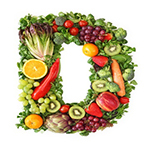 Low vitamin D levels have been associated with an increased risk of certain autoimmune diseases such as multiple sclerosis, type 1 diabetes, and rheumatoid arthritis. Researchers wanted to see if there was such a connection with Hashimoto’s thyroiditis, an autoimmune thyroid disease. In this study of 161 people with Hashimoto’s thyroiditis and 162 controls without thyroid problems researchers found those with thyroid disease were more likely to have low vitamin D levels that those with normal functioning thyroids. The authors of the study noted that more research is needed to determine if the low vitamin D levels cause thyroid disease or are a result of thyroid disease.